Preheat oven to 350 degrees F and line a 9x9 inch pan with parchment paper. In a medium sized bowl, combine and whisk all dry ingredients including oats, oat flour, baking powder, cinnamon, and salt. You can make your own oat flour by simply blending or pulsing ½ cup oats in a blender. Next, grate the carrot and zucchini. I used about 3 medium sized carrots and 1 small zucchini. Don’t forget to drain the juice of both. You can do this with a couple of paper towels. Simply squeeze the excess juice into a bowl. In in a separate bowl, mash the banana. Then combine with the flax egg, carrot, zucchini, coconut sugar or brown sugar, and plant milk. Mix until well incorporated. Combine the wet and dry ingredients as well as your choice of nuts, seeds, or dried fruit. Place the mixture into your pan and bake for about 30-35 minutes. 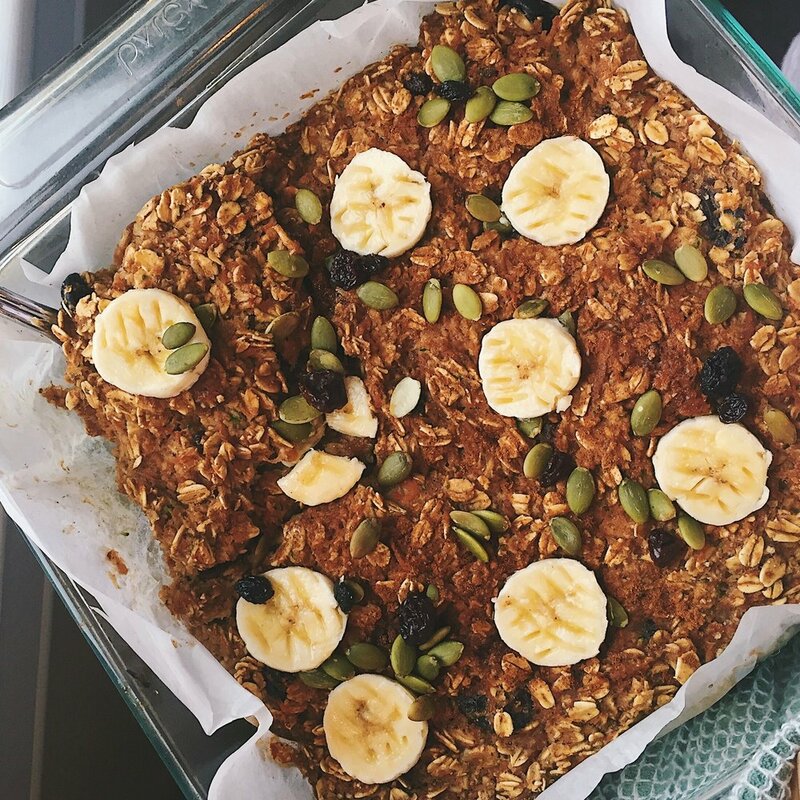 I personally wanted my oats to be soft and moist, so I baked for 30 minutes. Serve with your favorite oat toppings!